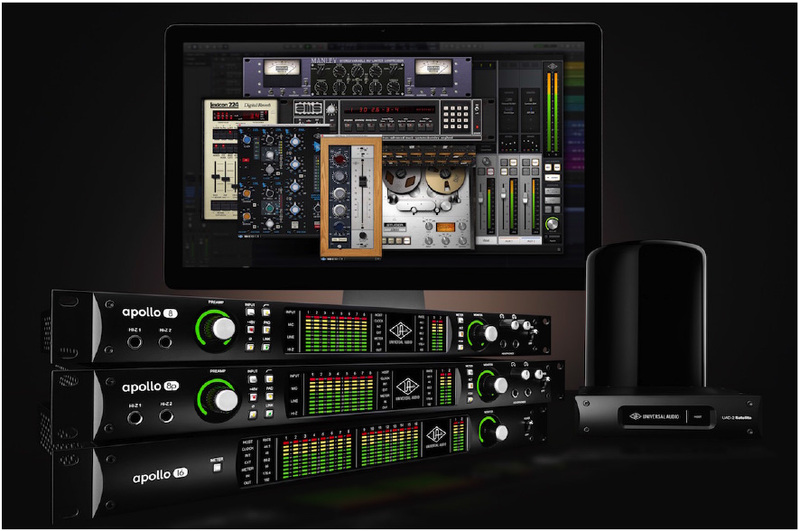 Universal Audio recently announced an all-new line of Apollo audio interfaces for Mac Thunderbolt users. With next-generation A/D and D/A conversion, new monitoring functions, Thunderbolt cascading of up to four interfaces, and Realtime UAD processing — all housed within a sleek, black aluminum package — the new Apollo interfaces push the standard forward for professional music recording and production. These all-new Apollos feature next-generation conversion for stunning sound, plus convenient “mix and match” operation of up to four units; New Apollo 8p model provides 8 onboard Unison-enabled mic preamps. Now shipping worldwide, Apollo 8 (US$1,999 w/ UAD-2 DUO Processing; US$2,499 w/ UAD-2 QUAD Processing) features four Unison™-enabled mic preamps for tracking through classic preamp emulations from Neve, API, and Universal Audio. Also included are new convenient front panel monitoring functions such as Alt Speakers, Dim, and Mono. Shipping in June, Apollo 8p (US$2,999 w/ UAD-2 QUAD Processing) features eight Unison™-enabled mic preamps, allowing recordists to track larger projects through classic preamp emulations from Neve, API, and Universal Audio. Apollo 8p also includes new convenient front panel monitoring functions such as Alt Speakers, Dim, and Mono. Also shipping in June, Apollo 16 (US$2,999 w/ UAD-2 QUAD Processing) features 16x16 analog I/O via DB-25 connectors, dedicated XLR monitor outs, and stereo AES-EBU digital I/O — ideal for producers and engineers needing Realtime UAD processing and world-class A/D and D/A conversion for their recording consoles and outboard preamps. Finally, Universal Audio is pleased to announce Apollo FireWire (US$1,999 w/ QUAD Processing). Now shipping worldwide, Apollo FireWire continues to offer Windows and legacy FireWire Macs Apollo-class A/D and D/A conversion, Realtime UAD processing, and 4 Unison™-enabled mic preamps for tracking through preamp emulations from Neve, API, and Universal Audio. Shop the new line of Apollo audio interfaces at RSPE Audio.